The educational entrance examination which is also known as Entry Test is an examination that educational institutions conduct to select prospective students for admission. It may be held at any stage of education, from primary to tertiary, even though it is typically held at the tertiary stage. The following subject wise Entry Test Preparation MCQs are going to help you prepare better for your entry test exam. In Pakistan, many educational institutions conduct entry test to select students for admissions in MBBS, BDS, Engineering and other degrees. 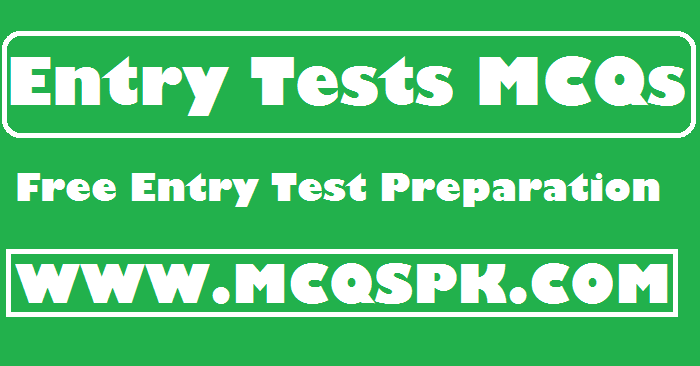 In this section of our website, you can find thousands of MCQs of entry tests like MDCAT, ECAT, ETEA, GAT, NAT, NUMS Test, Sindh MDCAT, AKU, FMDC and other entry test preparation. You can get entry test preparation for free here. Entry test is a test which is required to get admission in universities and colleges of higher education. Your admission in the required course is dependent on entry test marks very much because almost 50 per cent weightage is given to entry tests during merit calculations. So, entry test is of much importance as you cannot get admission in higher education institutes by just getting higher marks in your degrees. To get admission, you must score well in academic as well as entry tests. Here is the full list of Entry Tests which different institute conduct for admission to different degree programs. Just click on your desired entry test and start preparing for your upcoming entrance examination. Each entry test has thousands of Entry Test Preparation MCQs which are segregated subject wise for your convenience.